I think salt has been given a bad reputation recently, with the fashion of healthy eating. Do not let this put you off however! Last night I cooked up surf and turf, and added a few different accompaniments – My recently uploaded Chimichurri Sauce being one of them. I find lemon salt helps to compliment the fresh flavours of seafood, adding a citrus note whilst seasoning the food as you would normally. I decided to add this to my potatoes, bringing something different to the table. Use the finest side of your grater, to zest the lemon. Most lemons are waxed, so make sure you wash this off first. 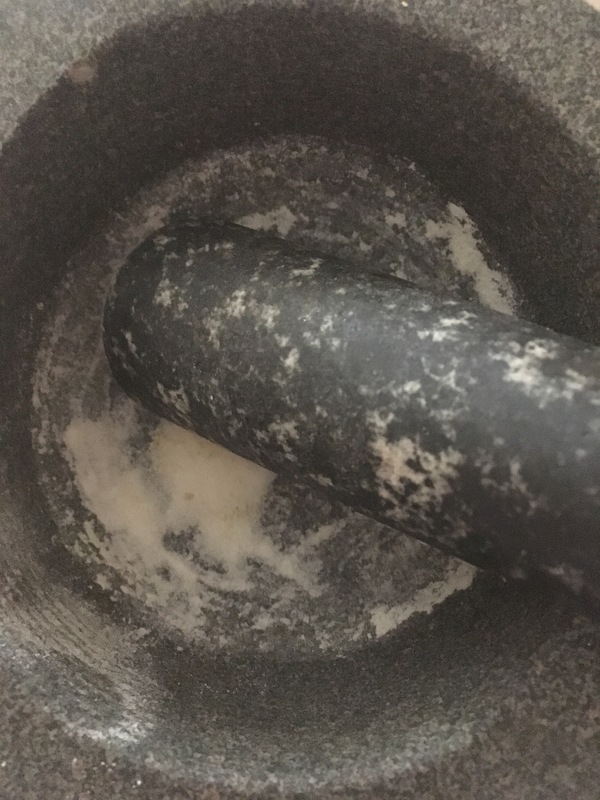 Using a pestle and mortar, bash together the zest and lemon until the salt. Heat sunflower oil in a high-sided pan, only use enough oil to cover the portions you intend to fry. Bring to deep-frying temperature. You can check this by placing a small chunk of potato into the cold oil before you begin to heat it. When the potato is floating and a dark golden brown, the temperature will have reached 180C, (remember to remove the piece of potato before you begin). Carefully place some of your potatoes into the pan of oil (don’t overcrowd it) for a couple of minutes until golden brown and crisp. Use a slotted spoon to keep the potatoes moving, because they are so thin, they have tendency to clump. Continue to cook the potatoes in batches, until all used up. Place potatoes in a mixing bow, and toss in the lemon salt.